Seahawks.NET - The Voice of the 12th Man! • View topic - Thomas Rawls vs. Christine Michael or Both?? I have Christine Michael on my fantasy team and he has been doing pretty well for me. Thomas Rawls was just dropped by another team in my league. Should I pick up Rawls too? Derrick Henry and Arian Foster have been doin' me dirty this season. I was thinking of dropping Derrick Henry and picking up Rawls. Foster has been injured so he hasn't helped me at all either but hopefully he will start playing again and playing well soon. Should I drop Derrick Henry and pick up Rawls? Drop Foster and pick up Rawls? Drop Michael and pick up Rawls or do nothing? I know it's a bye week (duh) but I want to snag him (Rawls) b4 someone else does when he is back. 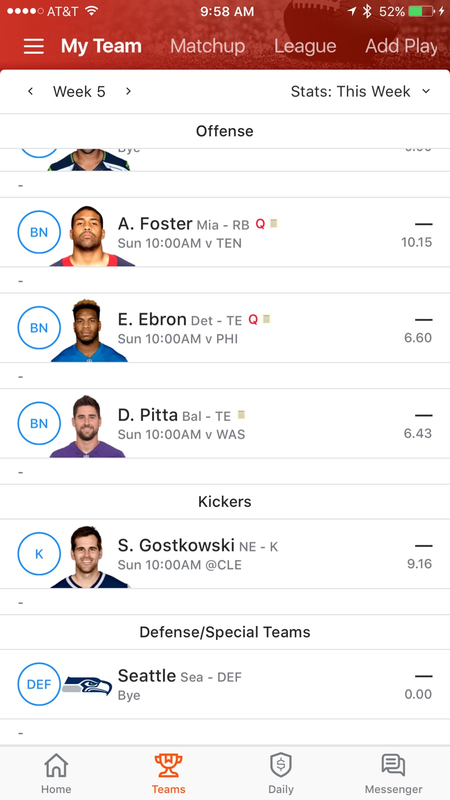 Here's my team: I just dropped Pitta Today for Miami Defense cuz of our Bye so that's a pending transaction. Re: Thomas Rawls vs. Christine Michael or Both?? Yeah I'd drop either Pitta or Ebron for Rawls. No need for three TE's on your team, especially when two of them are really average.